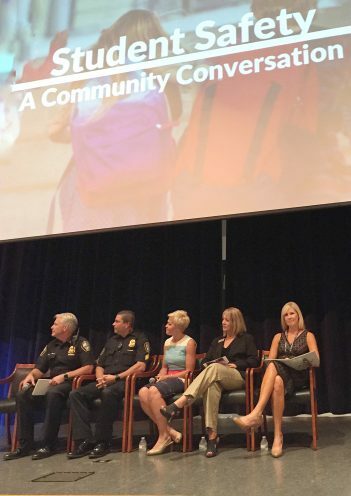 Carmel Clay Schools invited the public to a conversation about school safety and what is being done to enhance it Aug. 8 event at Clay Middle School. The program highlighted open and honest communication as key to crisis prevention. The panel of speakers included CCS Supt. Dr. Michael Beresford, Carmel Police Dept. Chief Jim Barlow, CPD School Resource Officer Sgt. D.J Schoeff, Carmel High School Assistant Principal Amy Skeens-Benton, CHS Assistant Principal Karen McDaniel and Tammy Thornbury, CCS assistant director of special services. Panelists encouraged students and parents to partner with educators and share information about suspicious behavior, advice received from family therapists or problems in the home. McDaniel said school officials respond immediately and anonymous reports can be made. Thornbury said parents should not fear judgement and that the stigma surrounding mental illness must be erased. Every adult in each school, from cafeteria staff to coaches, has undergone safety training, Skeens-Benton said. SROs forge meaningful relationships with students and have met with experts from Virginia Tech and Sandy Hook to gain insight. Social workers are ready to screen people of concern, visitor management systems are in place, K9s sweep rooms and 30 metal detectors have been ordered Beresford said. Sofia Balcius a senior at CHS and a national organizer for March For Our Lives, said her strong connection to staff members makes her feel very safe at school. Ed Turi, the father of two kids at CHS who attended the program, believes safety revolves around mental health. Turi’s primary concern is easy access to guns, and although he believes the school has taken excellent measures, he said more needs to be done to keep weapons locked up. Nicki McNally, the mother of four children in the school system, is calling for each school to have its own SRO and for a greater focus on counseling. She believes metal detectors will scare children more than they will be effective. The Noblesville shooting was “a wakeup call,” she said.